Happy Sunday to you all! Another Sunday, another group of awesome recipes from the Sunday Supper family. 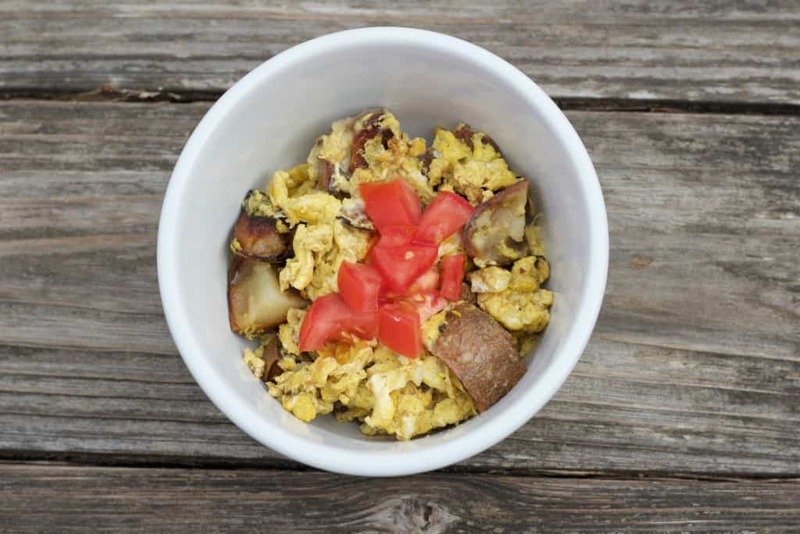 I think you will all really enjoy this egg, potato and cheese scramble this week – so simple! I make it for a quick weekday lunch, my kids enjoy it for dinner. Less than five ingredients – you can’t beat it! This week, as you can tell, the theme for Sunday Supper is EGGS!!! 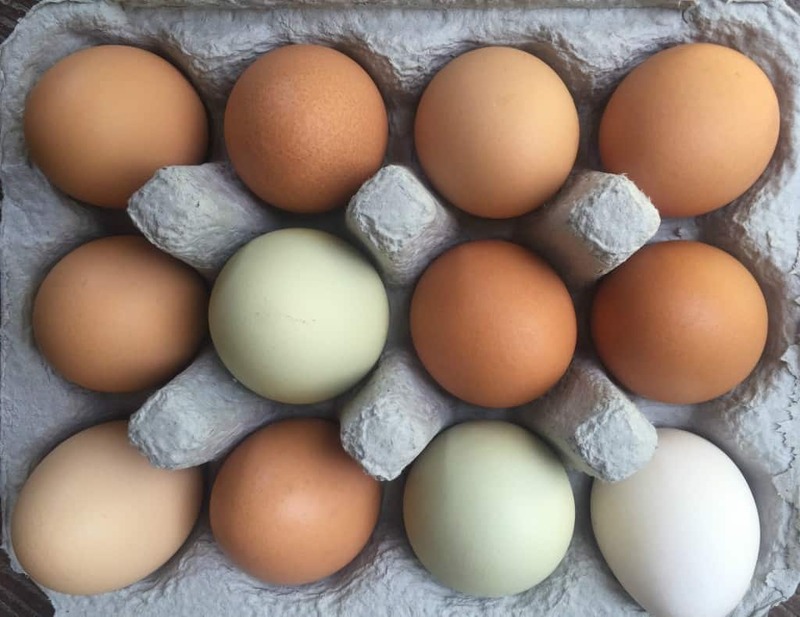 We are so lucky here in NC to have a lot of options for delicious, farm fresh eggs. If you could get gorgeous eggs like this every week, you would never buy another egg in the grocery store. This recipe is another of my favorite not-really-a-recipe recipes. Do you ever have leftover baked potatoes in your fridge? They last forever, don’t they?! Have you ever cut one open that has been sitting there awhile? Hmmm… not so pretty, but don’t throw it out! That ugly leftover potato is going to be AWESOME in this egg, potato and cheese scramble. It’s so hearty, it could really be eaten at any meal. I made a quick video this week to show you how easy it really is to make this! The trick with this recipe is to really let the potatoes get nice and crispy in the hot pan with butter that has just started to sizzle. Then add the eggs – they will cook quickly! Then add the cheese. Top with freshly diced tomatoes or salsa. Delicious! Got leftover potatoes? Leftover baked potatoes, egg, and cheese make up this delicious and super simple meal! Add potatoes and let cook until crispy. Whisk eggs together. Add a splash of milk. Add whisked eggs to potatoes. Stir well. Eggs will cook quickly. Remove from heat. Add cheese. Garnish with freshly chopped tomatoes or salsa! Enjoy! I love using leftover potato for an easy breakfast! 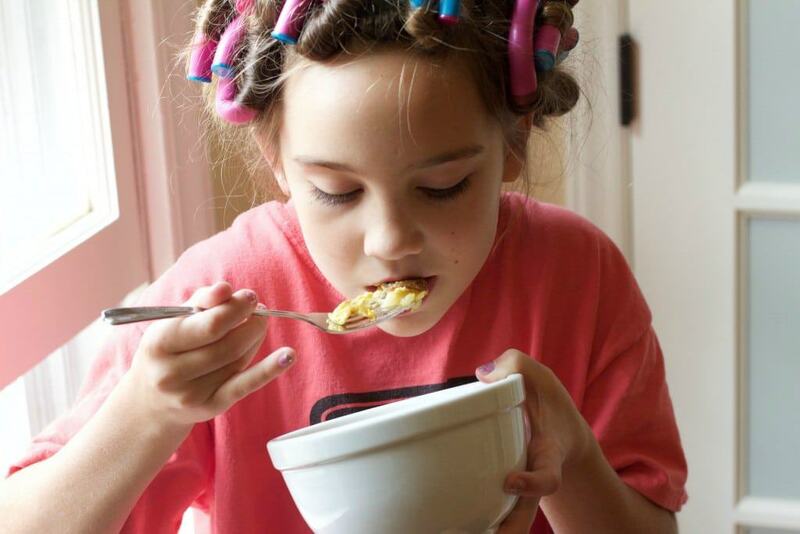 Love those curlers! Leftovers save my life!! 🙂 Aren’t the curlers too cute?? Yum!! This would be a yummy brunch idea! 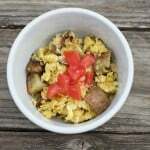 My husband loves eggs and potatoes so we might have to give this a try! A great use for leftovers! This is awesome, it’s like scrambled eggs meet home fries!! I’ve got to try this! Looks easy and good. great for weekdays! Thanks, Sue! This is often a quick workday lunch for me between meetings! What a wonderful breakfast dish! 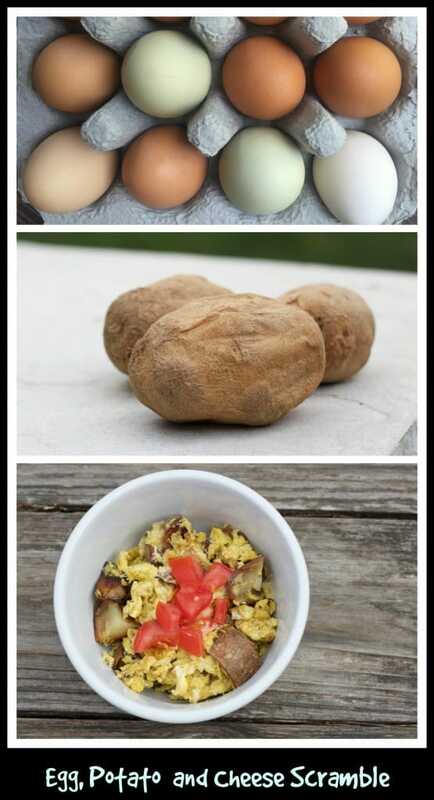 Since everything is already cooked (ie the potato), you could always make this for a breakfast during the week!! Yes! Exactly. It really just takes a few minutes. Awww! The curlers are adorable! We love using leftovers for breakfast too! Sometimes we even make extra just so we have some for breakfast the next day! Thanks, Sara! I made three extra potatoes just I could have some for breakfast! I’m a huge fan of one pot meals! I must try this soon. Such colorful eggs! This sounds like the perfect way to use up extra potatoes. Thanks! My kids LOVE seeing what colors the eggs are every week!